The car drove past us at full speed and honking. It took my brain half a second to realize that: 1) the car was driving the wrong way; 2) we where on a highway and; 3) nobody else seemed the least bothered with my realization. If you take apart India and analyze it, you come to the conclusion that this country should not work. Yet, somehow it does. This thought stayed with me every second of my two week visit to India. I’m always aware that my understandings of countries —based on just a few days— are simplistic generalizations. However, they help me organize my experiences into stories with a pinch of logic, and also make assumptions that help me believe I understood my surroundings. It has been a week after leaving and I still can’t wrap my mind around an unifying model for India. I don’t recall any other country that has challenged my pre-conceived assumptions so strongly. Therefore I had to approach this post differently: I’ll share three things India is. I had the amazing opportunity of staying in an apartment Nav’s Father rented for visiting family members, right next to their own place. 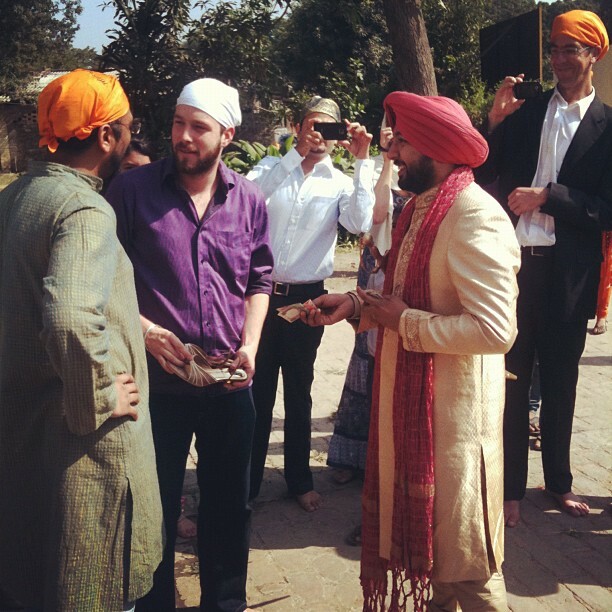 Alongside Knut-Jorgen and Wolf (an adopted son for them, since he lived in Chandigarh for 3 years), we not only got to enjoy the formal events, but also experienced a Big Fat Punjabi Wedding. The biggest impression (other than how cool Nav’s parents are), was how everyone’s attention turned to the bride and groom for the week. It wasn’t only good wishes, everything revolved around them —and their guests. I’m sure that if I had knocked on the door at 4am saying that I had craving for burger and beer, something would have been arranged. Customs seemed to reinforce this at every turn. While Catholic social events require the bride and groom (and their guests) to listen to a never ending sermon of what they must/mustn’t do/think/say, Sikh traditions seemed to focus more on retelling stories of failures and successes. More than once I arrived at the apartment to witness all visiting family members singing, clapping and laughing in some ritual without Fiona or Nav even being around. Of course, since I couldn’t understand a word anyone said, my anecdotes are not evidence. But I’ll just say before we even got to any party —an a drop of alcohol was served— I’ve heard and joined hours of laughter. In sights, smells and sounds, India keeps you at the edge of your seat at all times. The variety of smells was overwhelming: driving with a window open would take you on a trip that was equal parts fragrance, appetizing and —very suddenly— horrendous. A delicious aroma from food stalls would monopolize a street corner, and a few meters beyond a cinnamon-like smell of flowers will relax you, until a soft breeze would remind you that behind the bush is another name for public toilets. 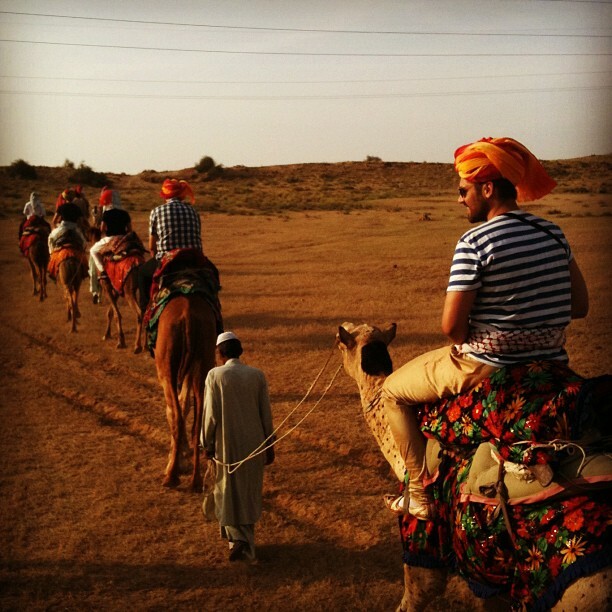 Camels, turbans and … powerlines? Same with colors; bright and beautiful dresses are worn by people adorning grey and dreadful buildings. On another block, brown dirt would surround a shining white temple. And then sounds… there are a billion reasons why you won’t experience silence in India. Luckily, the music is so fantastic, that you learn to live without it. In one of those world upside down perspectives for a westerner, if you can’t hear a car horn, you start to worry. My car dealership heritage couldn’t help but wonder what where the horn replacement rates, since they seemed to be connected to the accelerator and breaks. Driving in India is the best proof I’ve seen that there is order in chaos. Indians seem to take a very relativistic approach to its practice: how many cars fit in two lanes has little to do with physics. The concept of traffic lights is also extraordinarily complex to a foreigner: you don’t wait until your light is green, only until the other street in the roundabout is red. How do they know when that is? Still beyond my understanding. Parking lots are also as close as a real-life game of Tetris as I’ve ever experienced. When one is full, you just can’t imagine how anyone will ever leave… until you realize the car blocking you doesn’t have its parking brake. From here, a complex game of rearranging different cars, yelling to find that one person who did use the parking brake, and precise millimeter maneuvering ensues. But here is where the chaos draws an imaginary line that I failed to grasp. While the parking lot is difficult to even walk on, the sidewalk in front of the shops —where in Venezuela would be full of bikes and some SUV’s— is completely clear. How can a system that looks totally unregulated from the outside, create some semblance of order? I think people’s fear of dealing with corrupted institutions makes them avoid getting into trouble. I’ll remember my India trip as one of the best in my life. It was a perfect recipe: great old friends, a happy and grandiose occasion for two of them, and many new friends. All in a strange and foreign land. But I struggle with recommendation of India. There is not just one way to sum it up. India is raw, touristy, fun, stressful, relaxing, scary and welcoming. From now on, every time Nav asks “what’s the plan?” I’ll have some cultural background to understand the depth of the question. If you ever wanted to visit India, you should definitively go. Otherwise, if you think you should go, wait for India to find a reason to invite you. However, if any of my children ever read this: go to India. My genes have likely condemned you to over appreciate staying in your comfort-zone, and we miss a lot as a result. I’m sure that uncle Nav will have a great plan for you. Or worst case, weird uncle Wolf will also have some suggestion.